Art degraded, Imagination denied, War governs the Nations. Many of you reading this article were among the hundred or more people attending Irene's Movie Festival last November at which I first extended an invitation to people everywhere to join me in co-creating a ceremony acknowledging and celebrating human unity. The time for doing so has arrived and the ceremony titled Axis of Equal will occur worldwide this Sunday thanks to the many people who have networked my invitation to their friends and family. On the day of the Vernal Equinox, Sunday, March 20, people all over the world will now join together in performing the delicate act of balancing an egg on its end. 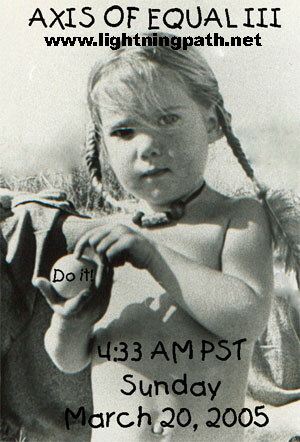 In this simple act we will co-create a ceremony that may inspire similar Equinox observances for generations to come. The exact time of the Vernal Equinox is 4:33 AM here on the West Coast and this is the focal moment for the ceremony worldwide. However, your performance of the egg balancing any time on the day will constitute full participation. Although balancing eggs on their ends seems to many to be a nearly impossible task, I assure you that it is really quite simple. At each of the Equinoxes there is a brief moment in time when day and night are of equal duration throughout the planet, North and South, East and West. This momentary point of balance in the Earth's orbit around the Sun enhances the probability of success in this delicate act. It is not that it cannot be performed at other times in the year. It can. Cortes residents Gary and Gillian Fast have both proved this fact by successfully balancing eggs earlier this week, as shown in the attached photo. There are deeper and deeper dimensions to this experience. On the surface, you will simply be balancing an egg on its end. At a deeper level, you will be aligning precisely the vertical axis of an egg to the axis of the Earth. At a deeper level still, you will be bringing yourself into alignment with the axis of the eternal present, the plumbline of transcendent insight at the center of your own worldview. Prior Axis of Equal documentation, including Quicktime movies of egg balancings are already present there for you education and enjoyment. Please send your contributions to: postmaster@dwayneedwardrourke.com. May this simple ceremony deeply empower us all with a tangible feeling of spiritual unity with each other and with the Earth itself. Ho!